Last weekend saw a thrilling weekend of Rugby in this years Six Nations. A historic win Italy over France, Scotland losing narrowly to England, and in Cardiff, Wales beating Ireland through a controversial try. 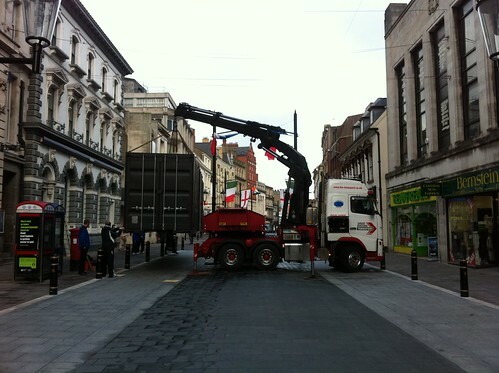 During game day, Cardiff transforms into a busy, cosmopolitan city full of colour and noise. For many it is a perfect opportunity to try and sell or advertise their business or brand. So who better to advertise during a game day than Under Armour – shirt manufacturer for Wales national team. 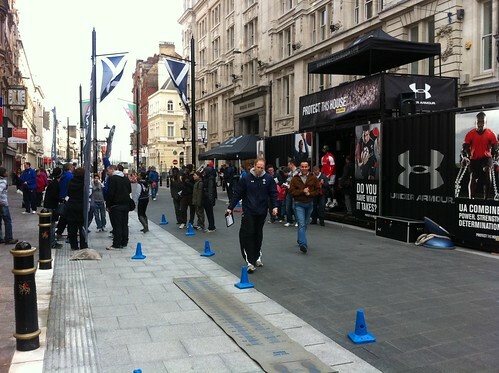 On the thursday before the game Under Armour brought in a cargo crate to expand the experience of Under Armour to the people of Cardiff. The area around the crate had been setup with loads of physical training challenges – from running and jumping competitions to skipping with huge ropes. The area was always really busy and there seemed to be a real buzz with music being pumped out all day. In all it was a well thought out event – pulling on key brand values of Under Armour and a great way to give someone a brand experience that went beyond a traditional billboard advert or flyer. Indeed while there were jerseys available to be viewed (and I think bought). It was much more about giving the customer an experience and a memory of Under Amour as being "Engineered to Perform". So after a very loud evening of revelry (Wales did win after all), I woke up and went to get some breakfast. As I walked past the area where the Cargo Crate had once occupied I came across the below rubbish and mess. 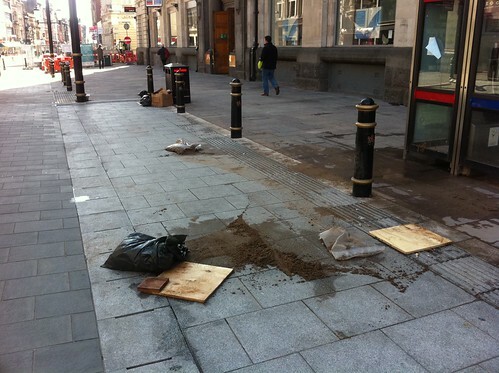 Sand bags that had weighted down banners and wood that had stopped the crate touching the new paving stones had all been left behind. So for me it left me with a sad memory of the event. One that I had thought was really cool and enjoyable. On a more interesting level I wonder how this translates to the brand of Under Armour and how deep do things go. While the whole company began through the pursuit to develop a superior t-shirt, it seems the question should be – at any cost?? It also seems to sum up a use and discard approach to the experience and a deep lack of understanding that for a sponsor of a National Jersey you dont's leave rubbish in their capital – or anywhere for that matter. For me there was a real breakdown in the Under Armour experience and the service that had been so high has now crashed.